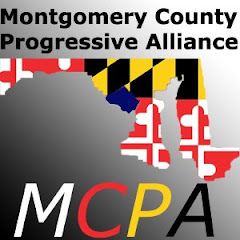 Montgomery County Progressive Alliance: Healthcare NOT Warfare in the Senate. Healthcare NOT Warfare in the Senate. Last Push--Deadline 5 PM ET Monday! On Tuesday, June 7, PDA joined our friends, National Nurses United/California Nurses Association (NNNU/CNA) in a hugely successful rally and lobby day in Washington. Over 2,000 people attended the rally in the morning, before dozens of citizen lobbyists headed to the Hill to meet with Democratic senators or their aides. We delivered our letter, asking for a significant troop withdrawal from Afghanistan beginning in July and to support Sanders' single-payer bill (S. 915)—signed by more than 16,000 peace advocates—to all the members of the Senate Democratic Caucus. Although we fell short of our goal to collect 25,000 signatures by June 7, the Senate is still considering the Defense Authorization Act, and we're still actively seeking more signers. At our meeting with Sen. John Kerry, we promised to deliver 10,000 more signatures on June 21. We're close to reaching that goal, but your signature can put us over the top and beyond. Click here to help us surpass our goal. Thank you to our friends at NNU/CNA, U.S. Labor Against the War, Labor Campaign for Single Payer Healthcare, Healthcare-NOW!, CODEPINK, RootsAction, and United for Peace and Justice, who also circulated the letter among their members. A special thank you to PDA Advisory Board member Thom Hartmann, who featured Healthcare NOT Warfare co-chairs Donna Smith and Norman Solomon on his June 8 program. Watch it here! We're closer than we've ever been to ending the war in Afghanistan, and the issue of spiraling healthcare costs is still unaddressed. The time is ripe for Healthcare NOT Warfare. Please help us top our goal. Senator Kerry wants to hear from YOU!